The American West was settled by many hardy types, pioneers in search of freer land, economic betterment, or adventure; but it was only the Mormons who set out with the promise of eternal life. The Saints who formed the Gathering of Zion in the faith of Joseph Smith and the leadership of Brigham Young began a permanent hegira to the West along the now symbolic Mormon Trail. Forced by Gentile hostilities to leave their site at Nauvoo, Illinois, the migrant flood began in 1845 and the "Twelve Apostles" reached the Great Salt Lake in '47, to be followed over the next twenty years by waves of American and European converts. Soon two-way traffic flowed over the trail--Mormon missionaries returned to the East, passing their Brothers en route to the "New Jerusalem." 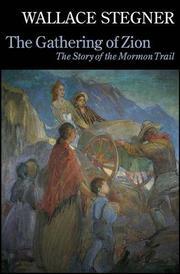 Written by a non-Mormon, this documented history of the Trail is the story of individual pioneers taken from their letters, journals and reminiscences. Concerned with how the West--not how the Faith--was won, the author manages to reconstruct another historical chapter of the American Frontier story-- undistinguished but interesting in its place.